Gaddafi was killed in 2011. He's pictured he in 1996. THE IRISH GOVERNMENT considered taking diplomatic action against Libya due to its support of the Provisional IRA but was worried about damaging a valuable trading partnership. New details about the government’s concerns about Libya’s funding of IRA activities have also been revealed as part of documents from the Department of the Taoiseach released under the 30-year rule. The documents from 1986, now in the possession of the National Archives, show that Taoiseach Garret Fitzgerald was also concerned that money from Muammar Gaddafi’s regime was “being used for political purposes” in Ireland. 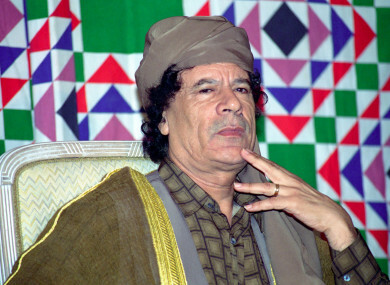 Links between the Provisional IRA and Gaddafi’s Libya have been well established, with the regime believed to have provided the paramilitary group with explosives and weapons at various periods in the 1970s and the 1980s. In a meeting between FitzGerald and Prime Minister Margaret Thatcher that took place in June 1986, both expressed concern about the links. Confidential notes on the meeting show that the Taoiseach spoke about a recent statement a senior Libyan official had made in support of the IRA. “We have asked the Ambassador to call again – without any real expectation that there will be a retraction,” FitzGerald stated. This will mean that we must consider next week what steps we are to take. We would need a formal public statement by Jalloud withdrawing the earlier statement of support for the IRA. FitzGerald also suggested different actions the Irish government could take, but admitted some reservations about the economic impact. Ireland had built up a trade relationship with Libya in the 1980s that meant the north African nation was the State’s single-biggest market for live cattle. “Action by us, if that is decided, will be difficult,” Fitzgerald said according to the documents. We export approximately £30m worth of meat there, equivalent to exports about £1bn from the UK. There may be a question of expulsion of some students or perhaps UN action. But even those would not produce the effect we want. FitzGerald went on to say that the biggest priority for the government in this regard was to “stop the flow of money from the US and Libya”. Thatcher noted that the Irish government “have done a fantastic job there” but FitzGerald responded by saying money was still getting through. “Perhaps the biggest potential source of funds for the IRA is Libya. Some of this is already being used for political purposes in our country,” he said. Email “Ireland considered sanctions on Gaddafi's Libya over IRA support but was worried about beef”. Feedback on “Ireland considered sanctions on Gaddafi's Libya over IRA support but was worried about beef”.